“If you cannot afford an attorney and desire one, the court will appoint one for you.” That is what police officers are required to tell every person arrested for a crime in the United States. In Oklahoma, since Nov. 1, 2013, there’s more to it. Until now, only those sentenced to probation in Oklahoma and not placed under Department of Corrections supervision were required to pay $40 a month as a “supervision fee.” Under a new law that took effect Nov. 1, 2013, everyone else must now chip in $960 to help pay the prosecution’s costs. Like the “supervision fees” the new law pays prosecutors based on how many cases they win. Oklahoma Watch, a public interest journalism project, reported that even prior to the new law district attorneys statewide generated 20 percent of their annual budgets from pay-per-prosecution “supervision fees.” In 2012, payments from about 38,100 people generated about $14 million for District Attorneys offices. A fiscal impact statement for the new 2013 law — HB 1328 – estimated the new fee for other probationers under private or DOC supervision could generate another $7.3 million in upcoming years. When a person on probation fails to pay court ordered fees, the typical result is that probation supervisors apply to the court to revoke probation. The person is tossed in jail, sometimes for days, weeks or even months. For those convicted of crimes, it means those unable to pay prosecution costs go to jail – which doesn’t exactly amount to equal protection of law for rich and poor defendants alike. For county taxpayers, it means additional jail costs housing poor defendants who can’t afford to pay for their own prosecution. Yet jail costs aren’t something district attorneys have to worry about when they set annual budgets. There are huge costs associated with using jail as a collection mechanism but a District Attorney has no reason to be concerned about the jail costs. A District Attorney can toss an indefinite number of indigent defendants in jail in a systematic effort to collect $960 from other defendants. Taxpayers will be none the wiser. What’s more, as district attorneys, they probably shouldn’t have any financial interest in the outcome of cases at all. Oklahoma rules of professional conduct prohibit lawyers from having a proprietary interest in litigation – except for contingency fees in civil cases, and liens or contracts to secure attorney fees. A lien does not give an attorney the right to throw the losing party in jail if losing side can’t pay the winning party’s attorney fees. But that’s what Oklahoma’s new law requiring defendants to pay for their own prosecution allows. The new law’s $960 fee also rather dubiously compensates DA’s for “the additional work of verifying the compliance of the offender with the rules and conditions of his or her probation.” These offenders, however, are under Department of Corrections or private supervision, so actual costs for DA compliance verification may be minimal – especially in cases where no application to accelerate or application to revoke probation is filed. 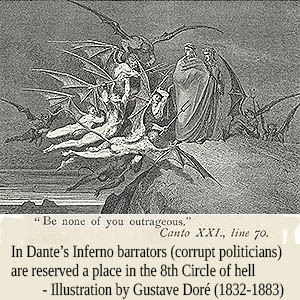 An even greater problem with the new law evokes a practice for which Dante’s Inferno reserves practitioners a place in the Eight Circle of hell. It’s called barratry – persistent overly zealous litigation for purposes of profit or harassment. In modern times, prosecutors often overcharge – or threaten to bring more severe charges – to persuade defendants to plea to lesser charges. Even factually innocent defendants will often plea to minor charges to avoid the cost and risk of defending against a more serious charge. The practice of overcharging to leverage plea agreements is problematic enough without the added incentive of systematic financial rewards for each guilty plea a prosecutor can rack up. One would hope legislators adopt laws solely for the purpose of protecting the public, and to maintain an orderly society in which everyone has an opportunity to prosper in life. The rules of conduct for lawyers seek not only to assure zealous representation of clients, but to make lawyers stewards of the quality of justice. When prosecutors enjoy an opportunity to fund their endeavors by the proceeds of their prosecutions, the stage is set for a heavy handed governance that seeks to expand its own power rather than to serve the public good. When prosecutors decisions about who to prosecute appear to be guided by prosecutors’ financial interests rather than by the pursuit of justice, public trust in the justice system can suffer. When prosecutors can increase their annual revenue by systematically crowding jails with defendants incarcerated solely for their inability to pay attorney fees, taxpayers at large foot the bill. Those same prosecutors can nonetheless woo voters with emotional law-and-order campaigns that have no basis in fiscal reality. One way that pay-per-conviction prosecution hits home for defendants is when they are jailed for inability to pay prosecution costs. While Oklahoma so far is allowing the practice, the law still sets limits on how long a person may be jailed for failure to pay costs. Those jailed for inability to pay are unfortunately often those who can’t afford representation. If you, your friend or family member is facing an application to accelerate or application to revoke probation for failure to pay costs long after the term of probation has lapsed, it may be worth considering whether the cost of an attorney is a better investment than waiting for prosecutors to cut them a break. For a free consultation with a Tulsa attorney, contact with Wirth Law Office’s criminal defense attorneys today at 1(918) 879-1681 or toll free at 1(888) Wirth-Law. If you prefer written correspondence, you may submit a question through the form at the top right of this page.